Bronze medalists from the IAAF World Championships in Beijing, Bosnian 800m specialist Amel Tuka and Serbian long jumper Ivana Spanovic, who was also crowned European indoor champion earlier this year, have been named Balkan Athletes of the Year 2015. 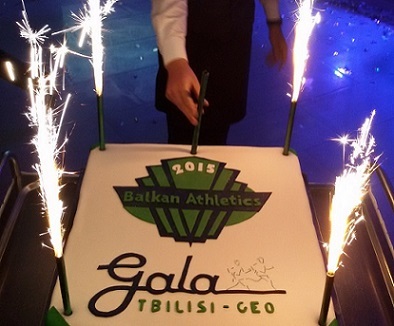 The two were presented their awards during the 5thВ annual Balkan Athletics Gala held in Tbilisi, Georgia, on 18 November. Tuka is the only Balkan athlete who is leading the world lists of the year. He won the Diamond League in Monaco with the amazing 1:42.51, which was world best result for 2015, and European 4th result in the all-time list. Spanovic won the European indoor title earlier this year in Prague where she set a new National record of 6.98. This is the second time for her to be acknowledged as Balkan Athlete of the Year. The first time was in 2013 in Yerevan. Romanian long jumper Florentina Marincu and Slovenian javelin thrower Matija Muhar, both European junior champions from Eskilstuna last summer, were given the Balkan Rising Star of the Year awards. Muhar won the European Junior title with a national record of 79.20 whish was also 2015 world best for this age group. To her gold medal in long jump at the European Junior Championships Marincu added a bronze one in triple jump. For her, this was the second recognition as well - she was Balkan Raising Star in 2013. European Athletics President Svein Arne Hansen and CEO Christian Milz were in attendance following their visit to Armenia earlier in the week. вЂњThe Balkan nations are passionate about athletics and we are noticing more athletes developing into international champions and we can expect the level to keep on rising in the years to come,вЂќ said President Hansen. 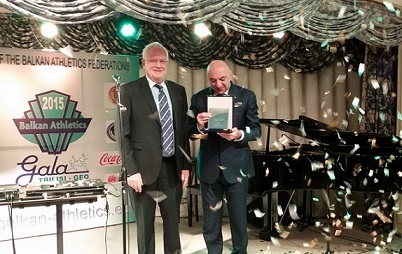 Dobromir Karamarinov, European Athletics Vice President and President of the Association of Balkan Athletics Federations (ABAF), praised the organisers for the successful staging of the event in Tbilisi.